BBC News - Is the 'Jade Effect' still working? Is the 'Jade Effect' still working? One year after Jade Goody's death, many worry her legacy - reminding women to get regular cervical screenings - has been forgotten. Does the Jade Goody effect still exist? And how can we maintain its influence as her memory fades? 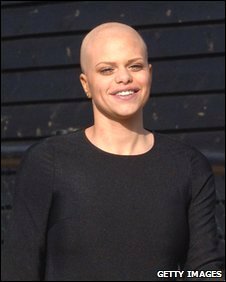 When reality star Jade Goody passed away after a battle with cervical cancer, her fans tempered their grief with the fact that her illness and death would inspire thousands of women to get regular cervical screenings. Goody, who first found fame on Big Brother, was diagnosed with cervical cancer in August 2008. She was told her cancer was terminal in February 2009 and died on 22 March 2009, aged 27. Even her harshest critics can't deny that Goody gave cervical cancer - and the test that detects cervical abnormalities - a higher profile. Each year in the UK, there are approximately 2,800 new diagnoses of cervical cancer and about 1,000 deaths from it. The NHS says cervical screenings, which detect cellular abnormalities that could result in cancer, save more than 4,000 lives each year. The NHS offers free screenings to women between the ages of 25 and 64. It send invitations for the screenings every three years for women aged 25 to 49 and every five years for those 50 to 64. In Scotland, Wales and Northern Ireland, cervical screenings begin at age 20. But young women are prone to disregarding the importance of cervical screenings. 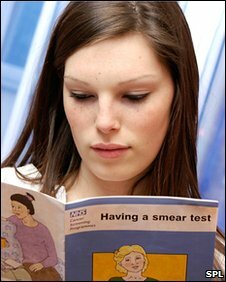 According to cervical cancer charity Jo's Trust, up to a third of younger women aged 25 to 29 do not attend their NHS screening. Although cervical cancer is most common in women aged 30 to 45, Cancer Research UK says it's important for younger women to be aware of the risks and get in the habit of attending their screenings. The overall number of women in the UK aged 25 to 64 who got their NHS screenings from March 2008 until March 2009 - the period of Goody's diagnosis, illness and death - rose about 12%. In the NHS's annual review of the cervical screening programme, this rise is largely attributed to Goody's influence. "The tragic death of Jade Goody raised awareness of the disease and the importance of screening, while Jade's bravery and openness in her fight against cervical cancer brought home to young women across the country the importance of regularly going for these checks," health minister Prof Ann Keen MP wrote in the report's foreword. "It was the first time in years the number went up," says Robert Music, director of Jo's Trust. "There was a significant increase in awareness on the national level." More significantly, women in Goody's age range - 25 to 29 - who had smear tests outside the cervical screening programme in England rose by a third compared with the same time period a year earlier. This includes women who requested the screening themselves or were invited or recalled by their GP. However, NHS statistics show that about 20% of women still did not get their regular screening in 2008/9 and about 3% have never had a cervical screening. And although health professionals and media outlets alike praised the "Jade Goody effect" during her illness and in the months after her death, one year on, they fear it's fading as fast as it came on. "It certainly did [have an effect] roundabout the time of her death, but it doesn't seem to have persisted," says Alison Baker, the president of the National Association of Cytology. "While it was in the public eye, it was massive." The official statistics for the year following Goody's death will not be available until October, but Mr Music says anecdotal evidence shows that cervical screening is decreasing - and may even be returning to pre-Jade levels. Research published in January in the Journal of Medical Screening - in conjunction with Cancer Research UK - suggests that women avoiding screening is a problem for educated, prosperous women as well as those from deprived backgrounds. It suggested women who are better off may understand the risks associated with cervical cancer, but don't think they have time to attend the screening. Women between the ages of 26 and 44 were most likely to say the busyness of life kept them away. "It was quite surprising, really," says Cancer Research UK's Jodie Moffat. "As soon as you get the invitation, you need to do something about it there and then. Before you know it, time slips by." Ignorance, a sense of invulnerability, and fear of the test or its results can also prevent people from taking up the NHS screening invitation, says Robert Music, director of Jo's Trust. Before Goody's diagnosis, "there was really poor understanding of cervical cancer, screening, and what it is," he says. "Cervical cancer is a largely preventable disease." Goody was 26 at the time of diagnosis and went through her illness in the public eye. At the time of her death, Dr Jo Waller, a psychologist based at University College London, said that the image of Goody without hair sitting in a wheelchair made people identify with her in a powerful way. Karol Sikora, professor of cancer medicine at Hammersmith Hospital, believes Goody's saga "scared" those from a similar background - those from less educated or deprived families - who are more ignorant of the risk of cervical cancer or simply don't care. "[Jade] had a big effect on people who are hard to reach by campaigning," he says. "[Her story] crosses this divide of people who don't worry about their health." He says that these kinds of "personal stories" of cervical cancer are the most effective way to reach these audiences, whether in the tabloids or soap operas. The anniversary of Goody's death is seen as an ideal opportunity to draw new attention to the issue. The anniversary is another chance for cervical cancer to be raised and [Jade's] legacy lives on very much in that respect." But although Dr Sikora attributes the recent rise in test-shirkers to our short memories, he and others are keen to make sure that legacy continues to live on. "We've got a preventable disease women can be proactive about, and they're not," says Mr Music. "It's sad that they've forgotten it's what killed Jade Goody." At 22 I'm not entitled to a smear test and have asked my doctor, yet my friend also 22 managed to get one and her results were abnormal showing she had pre-cancerous cells. I feel the age limit should be lowered if there is a risk for any women. The sooner women know there is a potential problem the quicker they can start keeping an eye on it. At the time of Jade's illness I was going through repeated call backs for abnormal smears and referrals to colposcopy clinic for further investigation. At one point I had got so sick of the indignity of it all that I ignored one of my call back letters. It was only seeing Jade's story reported on the news that prompted me to get back in touch and get sorted out. After approx two years of going backwards & forwards between doctors surgery and hospital I've finally had a "normal" smear test result - I need to repeat this again in August - but for the media attention on Jade's story I might have left it too long and not got the clear result I now have. I'm 25 and had my first smear about a month ago, the results showed I had abnormal cells in my cervix which turned out to be a relatively large area of pre-cancerous cells. I had them removed and now have to wait 6 months for a check up smear to see if everything has gone back to normal. I have to say I have never been so scared and worried! Because I am so young the likelihood of me developing cervical cancer later in life now is the same as everyone else, the younger you are the better you are at rejuvenating new healthy cells. I now will have to have a check up every year for the next 9 years. I can't stress enough to young women how important it is to get their smear done, it's not painful, it's not embarrassing, it doesn't take long and it can save your life. It has mine. I had my first smear test in 1976 at the age of 19. I think it is disgraceful woman are not called until 25 in the UK. I had a history of CIN which resulted in a hysterectomy in 2006. Cancer was detected at 0.05mm. I have been very lucky and realise screening is very important but think starting at 25 is too late. my first dodgy result was when I was 23. I find the latter part of this article quite insensitive. I am a younger woman (25-29) and have been for two smear tests. Both times have been unsuccessful due to the fact that the process was extremely painful and the clinician did not therefore continue. Because I have not had a successful smear test I am classed among the "test shirkers" with apparently "short memories". I haven't forgotten about what happened to Jade Goody, nor am I ignorant. The thing is, smear tests *are* very painful for a lot of women and I find it irritating that articles like these never seem to acknowledge that.